We are proud to be chosen as the Supplier of the Year by eTextile Communications. They seek to provide insight into issues affecting the global textile industry, and it is an honor to be the top of their list amongst industry professionals. "THE TOTAL PACKAGE - In 35 years, Conitex Sonoco evolves into global leader as textile industry supplier." GASTONIA, N.C. – From humble beginnings here in 1982, Conitex Sonoco slowly but surely became synonymous with the textile industry. The company transformed itself from a fledgling yarn cone manufacturer for the then-booming textile industry of the Carolinas and other parts of the U.S. to a global packaging solutions group with more than $250 million in sales and a physical presence in 11 countries across four continents. Principles such as: Customer focus. Continuous improvement. Trust and respect. And high ethical standards. The stuff of which success stories are made. At least from a foundational standpoint. Those underlying fundamentals played a critical role in Conitex Sonoco’s finding the keys to survival and success, insiders said. Diversification, of course, has figured prominently into the company’s ability to flourish. And company leaders count expansion as an ingredient. Not to mention a strong desire and accompanying playbook to be a leader in its field. A longtime leader in paper cones and tubes to the textile industry, the company over the years has broadened its production repertoire to include corrugated pallets, sliver cans and labels for the textile industry and flexible bulk bags for several other sectors. As such, it is now considered a true packaging solutions provider. For its global market leadership in its areas of expertise and the high standards and expectations, quality and service it has established, Conitex Sonoco, celebrating its 35th anniversary this year, has been named eTC’s 2017 Supplier of the Year. Let’s take a peek at how it got here. After about a year in business, Spain-based partners José Ma Artiga Sr. and Pere Valls of TexPack appointed Artiga Sr.’s son, José Luis, to lead their upstart cone manufacturing plant in Gastonia. Artiga, whose father and grandfather were pioneers in the manufacture of paper cones for spun yarn, worked hard to prove his ability to lead and operate this new venture when he began the reformation and growth of Conitex, formerly an importer-wholesaler to the U.S. textile industry, according to the company. In doing so, he surrounded himself with a strong leadership team, which has guided the growth and diversification of Conitex for more than three decades. Among them is Michel Schmidlin, now Chief Operating Officer, who joined the company in 1985. With paper cones as its first product, “we brought a superior product and a customer service philosophy that allowed us to deliver within two weeks, and that was a new standard in the industry at that time,” he said. With the U.S. industry beginning to see hairline cracks in its massive infrastructure in the mid-1980s, Conitex began to look to the rising East. So in 1987, it opened its first plant outside of the U.S., in Taiwan, and Schmidlin was charged with starting up the operation. In 1994, the company expanded into open-end tube manufacturing and brown-and-round industrial cores. These forays into the tube and core market prompted keen attention from industry giant Sonoco and, in 1998, Conitex executive members accepted a 30 percent equity partnership with Sonoco to form the joint venture, Conitex Sonoco. 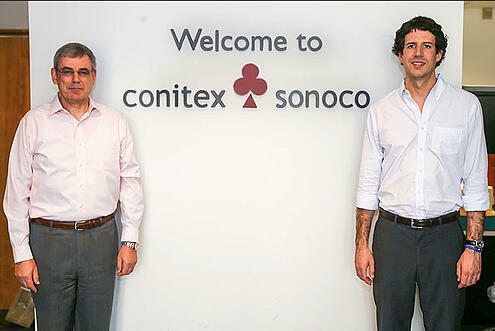 As part of this deal, Conitex Sonoco acquired cone manufacturing facilities in South Carolina, Greece and Mexico. In the 2000s, the company extended its product line and capabilities by adding sliver cans, corrugated pallets and labels. Then in 2012, the company became one of only a handful of bulk bag suppliers with U.S.-based manufacturing and warehouse locations when it acquired BulkSak, Inc. of Malvern, Ark., where it produces flexible intermediate bulk container (FIBC) bags. During the U.S. textile industry’s downturn, the company realized it needed to diversify its product offering, Schmidlin said. “That's when we did some soul searching and, really, discovered that what we really do is packaging, which led us into these other areas, including the innovative pallet business and the FIBC business,” he said. Today, the company operates with four divisions: Converting; Paper, Flexible Products; and Adhesives. In 2012, José Artiga’s son, Alex, joined the company after working for several years in investment banking in London. Other senior leaders in their U.S. headquarters include CFO Joaquin Viñas; David Monteith, Vice President of Flexible Products; Agustin Marin, Vice President of Converting; Igor Lisitsyn, Director of Continuous Improvement. With about 100 employees at its 103,000-square-foot facility here, Conitex Sonoco manufactures its textile cones and tubes and corrugated pallets. All of its cone-making machinery is proprietary, and that requires engineering staff in Gastonia and at all of its locations, to maintain and to enhance the equipment. Globally, the company operates 13 plants and employs about 1,200 people. Asked for their perspectives on the company’s keys to success, Schmidlin and Alex Artiga offered similar responses. Another strength, as noted, is the leadership of José Luis Artiga, they added. Alex Artiga sees his dad personally and professionally from a closer angle. The strive for excellence by José Luis Artiga – and, by extension, the company – translates into top-quality products, Schmidlin said. Take its charter product, the paper cone, for instance, when asked to compare it to plastic, he explained. "That we've maintained our original values of offering quality products and of delivering the best customer service that we can deliver has been a very important part of our success." Most of the company’s products, including cones and tubes, are custom-made to meet customer requirements, Alex Artiga added. Speaking of its core product, the company manufactures approximately 1.5 billion cones and tubes annually, worldwide. Additionally, Conitex Sonoco touts itself as being very much socially responsible. Globally, all of its paper goods are made from 100 percent recycled paper, Schmidlin said. And, of course, those products can be recycled over and over again, he added. Oh, and 1 percent of the company's operating income is dedicated to investment in socially responsible activities and donations for surrounding communities in the countries in which it operates. The company does this as part of a worldwide effort to help feed individuals and families in need by supporting local food banks such as Bread Inc., Second Harvest Food Bank and Arkansas Food Bank. In places such as Indonesia, it distributes food items and holds free medicine clinics for the villages surrounding its facility. And in China, it sponsors scholarships for local school children as well as college scholarships for the children of employees, performs blood drives in cooperation with the Red Cross and sponsors care for senior citizens in extreme living situations. Today, textiles still constitute about 40 percent of Conitex Sonoco’s business, so it remains a large and important part of its business. With the made-in-America movement beginning to hit its stride, the company prides itself on its local-for-local model, especially in the U.S., Schmidlin said. Since the re-shoring migration began, the company has seen an uptick in investment by players new and established in the U.S. yarn-spinning sector, which “is a good sign,” he added. “And we'll continue to serve the industry as best we can for many years to come,” Alex Artiga added.